Was born in 1866, and educated at Eton and New College, Oxford. A prominent sportsman, he has always been extremely interested in sail as well as power craft. One of his first boats was the 18-foot cruiser Grebe. This he owned in 1885, and sailed on the Beaulieu River and the Solent. It practically marked the beginning of small-class racing in the Solent. He has also owned the Calva (2½-rater), the White Swan, the Siola, the Cygnet, and the Calisaya. With White Swan and Siola he won several matches. The Calisaya, a 30-ton cutter, he uses at present at Beaulieu. Yarrow Napier. Lord Montagu of Beaulieu. 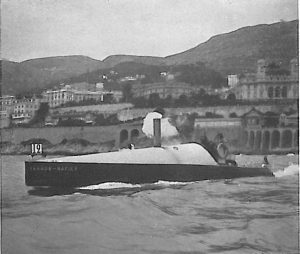 season, however, he, with Mr. Lionel de Rothschild, became owner of Napier H., built by Messrs. S. F. Edge, Ltd. She was raced most successfully through the season, and, being winning boat in the Eliminating Trials in the Solent, represented England in the International Trophy Race at Arcachon, and won easily, Lord Montagu acting as steersman in this and other races. On September II Lord Montagu and Mr. Lionel de Rothschild then acquired the fast racer Yarrow Napier, which they raced at Monaco early in the season of 1906. Lord Montagu again won the International Trophy in August, 1906, with Yarrow Napier. Yarrow Napier is one of the fastest boats of her class afloat. Lord Montagu was elected a member of the Royal Yacht Squadron in 1906. He is Commodore of the Hythe Yacht Club. Clubs: Royal Southern, Royal Yacht Squadron, Castle, Hythe. Residence: 3, Tilney Street, W.